Having recently restarted watching the entire Buffy The Vampire Slayer TV series and becoming an even bigger fan of the show than I was when it originally aired, I had to get my hands on the Buffy Season 8 graphic novels! It's taken me a few months to do so, but here they are finally. There are 8 volumes in total, each containing 5 issues of the comic book series. I've gotta say that if you're a Buffy fan and haven't picked these up yet, you must! I'm not usually a reader of comic books or graphic novels, but I felt that I couldn't miss this chance to find out what happens to all the characters after the TV show. Worldwide cult phenomenon Buffy the Vampire Slayer returns with Season Eight––only in comics! 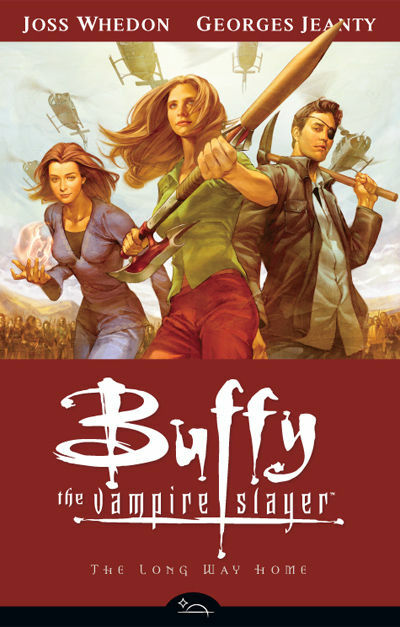 Series creator Joss Whedon once again takes up writing duties for this official sequel to the show, running the comics as he ran seven seasons of Buffy on TV. This opening story introduces a mysterious threat known as "Twilight" and plunges Buffy and the gang into their biggest adventure––without the limitations of a small-screen budget. Volume 1 introduces us to this new world in which a few hundred of the newly activated slayers are working for Buffy and the gang in 10 separate squads. Now that Sunnydale is no more, headquarters are now set up in rural Scotland, and together they train these girls to fight against the 'Big Bads'. There are huge monsters, bigger plot twists (trust me) and plenty of nail biting moments. And as creator Joss Whedon writes for this series, plenty of the character's charming qualities and definable wit is in the dialogue. It's very true to the show. But I'll admit that it wasn't love at first sight for me. I originally disliked the shortened dialogue and the storyline (they really take advantage of the no-budget-to-worry-about deal! And why not? I ask myself now. All comic books do this.) Though as I read on, the story got more and more interesting and I also got used to the narrative style. I guess what you're supposed to do is pick up additional description and detail from the drawings––not relying solely on the words as you would in a normal book. Took me a little while to 'get the hang of' this, but I've got it now. Jeez, this just gives away how much I don't read graphic novels, doesn't it?! By the end of volume one I was hooked, and quickly went out to get volume 2 (which is, for the record, even better than volume 1)! I'll review that one next week. Definitely recommended to fellow slayer pals!